The RTW Bloomberg engine allows users to access Bloomberg data via the Bloomberg API in Microsoft Excel. The RTW Bloomberg engine can subscribe to all information available via the Bloomberg API. The information available through the Bloomberg data distribution system is a subset of the information available via the Bloomberg terminal. Contact your Bloomberg representative to discuss your data access with the Bloomberg API. The RTW Bloomberg engine requires a Bloomberg terminal with a valid login and the bbcomm communication process. This software must be installed on your machine and be actively running. The bbcomm communication process must be running to subscribe with the RTW Bloomberg engine. We strongly recommend that you consult the Bloomberg manual for more information regarding the Bloomberg terminal. This section provides information about editing the RTW Bloomberg engine configuration options using the RTW rtconfig Editor. The options are located under the Bloomberg tab of the Rtconfig Editor dialog, and correspond to those found in the rtconfig file located in the installation directory. To manually edit the RTW Bloomberg engine configuration options in the rtconfig file, see Manually Editing the rtconfig File. 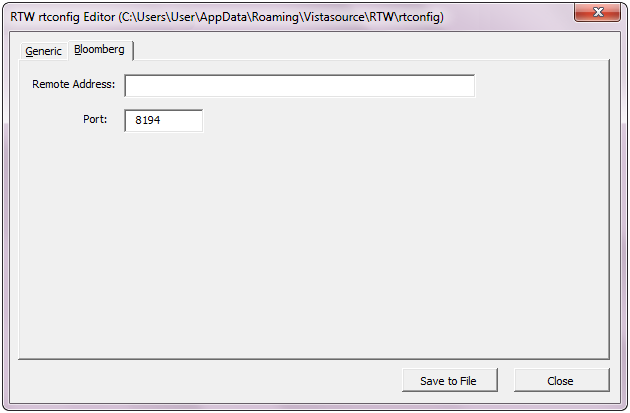 To edit the RTW Bloomberg rtconfig settings, select Vistasource → Settings → Rtconfig Editor and then select the Bloomberg tab. Refers to the rtconfig file option “bbRemoteAddress”, which allows entering the IP address of another machine in your network from where the RTW Bloomberg engine can be accessed. The IP address of the machine from which you run RTW must be registered with Bloomberg to use the Remote Address option correctly. If an IP address is not defined, you can only use the RTW Bloomberg engine on the host machine where the bbcomm process is running. Refers to the rtconfig file option “bbPort”, which specifies the port that the RTW Bloomberg engine uses to try and establish a connection with bbcomm. If no port number is entered, it will default to port 8194. You can also specify 0 (zero) to request that the port is looked up in the tcp services file.